�This disingenuous claim is also a woeful design by the APC to overburden, distract and bog down the Presidential election petition tribunal with trivialities, lies and falsehood, so as to derail the course of justice. �Such diversionary tactic has however only helped in further exposing the fact that the APC has no answers to the plethora of overwhelming evidence before the tribunal that the election was won by Atiku Abubakar and the PDP. 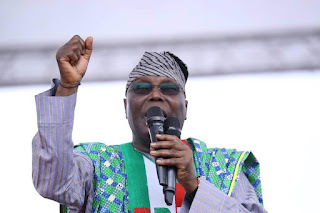 �Whereas Atiku Abubakar�s citizenship by birth, even under our constitution, cannot be contested, it is indeed the biggest irony of the year, that Atiku�s citizenship is being disputed by individuals whose ancestry has always been a subject of debate. �These individuals include those who, being not sure of their origins; have no love for Nigeria and even refused to be on the side of our nation at the 1985 summit of the defunct Organization of Africa Unity (OAU) in Addis Ababa. �Such persons prefer to deploy our national resources for infrastructural development in affiliated places outside the shores of Nigeria, when our country is in dire need of attention. �The apparent links were further manifested in the participation of aliens in the campaigns of a particular Presidential candidate in Kano. �Moreover, this claim by APC appears to contain explanations as to why its administration has remained insensitive to the challenge of insurgency, general insecurity and economic travails of Nigerians in the North East, particularly in Adamawa, Yobe, Borno and Taraba states. �In any case, Nigerians should not despair as the PDP and Atiku Abubakar will not be distracted in the pursuit of our mandate. �The PDP has implicit confidence in the competence of our legal team to handle the diversionary� antics and technicalities of the APC to unnecessarily overstrain the tribunal and derail the course of justice in the matter,� the statement read.